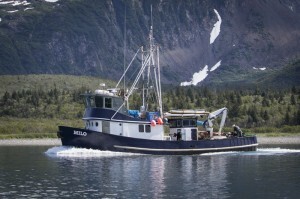 The M/V Milo is a former commercial fishing vessel, built for fishing the North Pacific not for luxury accommodations! 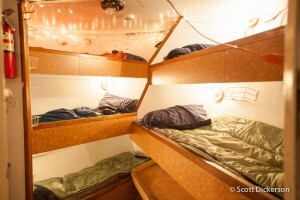 Although a lot of restoration and retrofitting has gone into the boat, the accommodations are much more commercial fishing crew quarters than luxury hotel. 5 bunks are located in the ‘foc’sle.’ Two more bunks known as ‘the igloo, 1 & 2’ (may be used as a doubles for couples) are located in ‘the Boardroom’ mid-ships. The bunks are comfortable, warm and (mostly*) dry. Sheets, pillows and sleeping bags are provided. There’s a bunk size shelf + a cabinet & drawers so you’ll have plenty of room for your stuff. Please be sure to read the tips on what to bring. 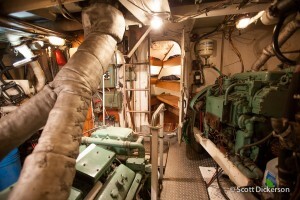 As part of the authentic Alaskan adventure, you’ll get to know the engine room as you pass through to get to your bunk in the foc’sle. We’ll provide hearing protection and you’ll want to wear it when you pass through if the engine is running. 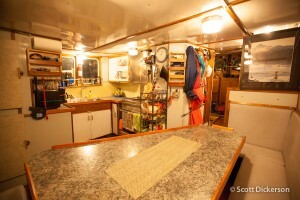 The galley has a small fridge and freezer, a diesel stove for cooking on a stove-top and baking (and keeping the cabin cozy). The galley is well stocked with snacks, fruits and makings for a mini-meal anytime. The galley is well appointed and functional. And the galley table is big! This serves as not only the kitchen but a great cozy hang-out space. New this year, a Salon on the back deck provides additional lounge, table, and storage space with a view. Nice and quiet, this is a great place to chill while we are underway. The Boardroom is the primary gear storage and staging area. There is plenty of space for hanging & drying your wetsuits, boots and other gear. Surfboards, skis, kites, camera gear, whatever you’ve got you’ll find space here. Don’t forget to consider the recommendations on what to bring. * when the seas get rough and the waves wash over the deck, a little water may make it in. 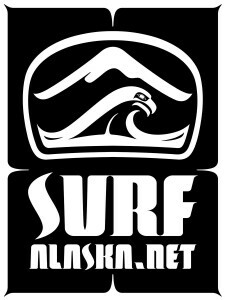 It’s not serious and rarely even uncomfortable but it’s the reality on an authentic Alaskan adventure (most likely on a surf mission) on the M/V Milo. Good crew = Good times. Thank you guys so much for helping us explore where our imaginations wandered. Surfing in a bay of snowcapped mountains has been added to my most beautiful days list. Quite a hidden world of gems you guys have yourselves. Keep in touch and hope to make a much longer deep exploration happen on the awesome MILO…Boomkanani!